In the recent past we have been reminded that the anti-Semitism which has existed for centuries still permeates throughout the world, even here in the United States, a bastion of religious freedom. We cannot and will not tolerate bomb threats of our Jewish Community Centers or the desecration of Jewish cemeteries. Local incidents of racism and anti-Semitism, such as the destruction of menorahs and desecration of property with swastikas, have created fear and uncertainty in many which cannot be tolerated. Now is the time to build connections with other ethnic and religious groups to promote civility and respect for one another. 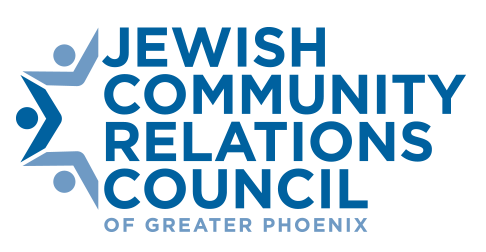 The Board of Rabbis of Greater Phoenix, both collectively and as individuals, continues to engage in this work of building bridges and encourages you to also similarly reach out. We are proud of the work we have done , with support from the Jewish Community Foundation, to birth the Jewish Community Relations Initiative. The founding board has been created and soon will begin its work in earnest, working with the Jewish, multi-faith and political communities to protect our interests and ensure that our perspectives and values are heard. Within our Jewish community, we must all find ways to work together, regardless of our religious practices and beliefs, to combat those who would seek to diminish and harm us. Kol Yisrael arevim zeh b’zeh – all Israel (the Jewish people) is responsible for one another (Talmud Shevuot 39a) . Please click here to read the full text of the Murphy-Crowley letter, signed by more than 150 Democrats and Republicans, urging federal agencies to address the recent bomb threats against Jewish Community Centers. We encourage you to share this with your congregants/members.